Mount Semeru Summit is the highest volcano in Java Island Indonesia with elevation at 3,676 meters above sea level. Its altitude almost similar with Mount Rinjani Lombok at 3.726 meters above sea level. Semeru volcano summit called as "Jonggring Saloko" the spelling of Java Languange. It administratively located between of two districts, namely Malang and Lumajang districts and still included in ​​Bromo Tengger Semeru National Park. According of geographical science, Mount Semeru Summit East Java located between 8 ° 06 'latitude and 112 ° 55' east longitude that consist of Dipterokarp Hill forest, Upper Montane forests, and the Forest Ericaceous or mountain forest. "Mount Semeru Volcano" known as the best tourism for Volcano hiking tour after Mt Rinjani hiking, Most trekkers from all the world enjoy Mount Semeru climbing package to see spectacular sunrise from the highest volcano in East Java Island. 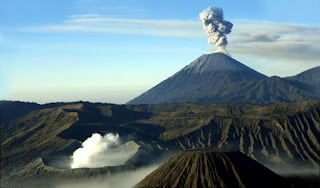 Semeru Volcano Eruption is differerent with Mount Bromo eruption In 1913 and 1946. Semeru summit crater or Jonggring Saloka has a dome with a height of 3744.8 m to the end of November 1973. To the south, the dome is to break the edge of crater summit caused lava flow leads to the south side covers an area Pronojiwo and Candipuro in Lumajang. Mount Semeru Summit East Java erupted since at 1818, at least 55 eruptions have been recorded (10 of which resulted in fatalities) Semeru Summit has been in a state of near-constant eruption from 1967 to the present. At times, remaining eruption always occured in small levels in every 20 minutes or so. The name “Mount Semeru Summit” derived fom Mahameru, the central world-mountain in Buddhist cosmology and by extension Hinduism. As stated in legend, It was transplanted from India. the Summit of Mahameru tale recorded on the 15th-century East Javanese work Tantu Pagelaran. Semeru was originally placed in the western part of the island, but that caused the island to tip, so it was moved eastward. On that journey, parts kept coming off the lower rim, forming the mountains of Lawu Summit, Wilis, Kelut, Kawi, Arjuno Summit and Welirang. The damage thus caused to the foot of the mountain caused it to shake, and the top came off and created Penanggungan as well. Indonesian Hindus also hold a belief that the mountain is the abode of Shiva in Java. Most tourist interested hiking package to Mount Semeru summit although it known as the highest one in East Java Island, But hiking to Mount Semeru really presents very impressed memories when because the trip need 2 nights camping on Kumbolo Lake and Klaimati Camp. The best time to enjoy Mount Semeru Hiking Package on April – November months, these month still dry season. Along rainy season between Januari – April nomally closed for hiking activity due to rainy season has go on that sometime occured a landslide from the steep slopes and also slippery trekking condition. To reach Mount Semeru summit in East Java, You can start your trip from Surabaya Airport, Malang or Banyuwangi Ketapang Harbor. The nearest way is from Surabaya through Malang route using the public transportation or by Travel Agent in Surabaya. To reach the Summit of Semeru volcano, You also possible travel through Probolinggo City East Java. Some visitors choose Probolinggo route cause able cross the Savannah Mount Bromo using the organized Jeep rent Mount Bromo during 2 hours trip from Cemoro Lawang. The ideal duration for Semeru volcano hiking package is 4 days 3 nights when You arrive from Malang or Surabaya by staying 1 night at Homestay around Ranu Pane village. For detail information about hiking tour package option, You can read the links below. For detail information about about hiking package to Mount Semeru Summit East Java, and Mount Bromo tour package, accommodation and other nature tourism package in East Java Island, You can visit Our Contact.